It would be nice if there was a note on the description page of WhoGo Maps with a link to Pure Maps like there already is on the description page of Poor Maps to WhoGo Maps. I presume that this search is regarding offline use. You could check out osm scout server user's manual (available online, see about page of the server) and follow description of Poor Maps configuration in the manual. Poor Maps is predecessor of WhoGo Maps and the options are almost the same. Let me know if something was not clear in the manual here or opening an issue at osm scout server github repo. first of all, congratulations for your work ! - it seems impossible, or I didn't found the feature, to have choice among several routes ? - I have no result from route searching without network. Is it possible, and how ? Thanks again for your work, and for what you can do for my questions. Multiple routes: I don't know about other routers, but Valhalla doesn't support it yet. There is also a question regarding automatic rerouting - that would be dangerous to choose route while driving. 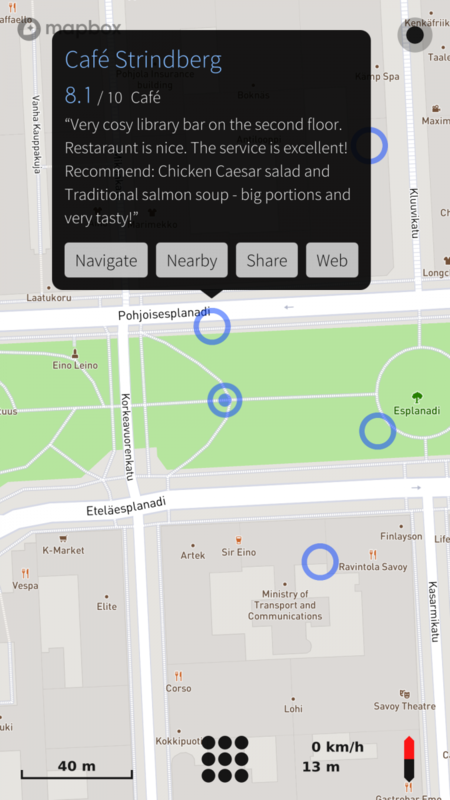 Offline: OSM Scout Server is written to allow you to use this application offline. This includes finding the routes. If you have the server installed, then either the data is missing or there is some misconfiguration. AutoZoom: please open an issue at github regarding it. Do you know any good implementation of it? I would expect that finding the right zoom levels is the main work. Saving POIs: this is planned, corresponding issue is already opened. Got the while thing working. Thanks rinigus, this is a fantastic app with great functionality. Hopefully we can increase the voice navigation as noted above but the navigation is excellent!!! -Would it be possible to augment the the time out for the ''auto center'' option. Many time while driving in navigation mode ,pending the zoom level, swiping the maps to have a heads up of the incomming route is nice but the ''auto center'' kick's in before we have even time to finish the swipe at all. Let say , a good 5 sec delay before it recenter the map to the actual position give time enough to swipe, have a good look while safely driving. 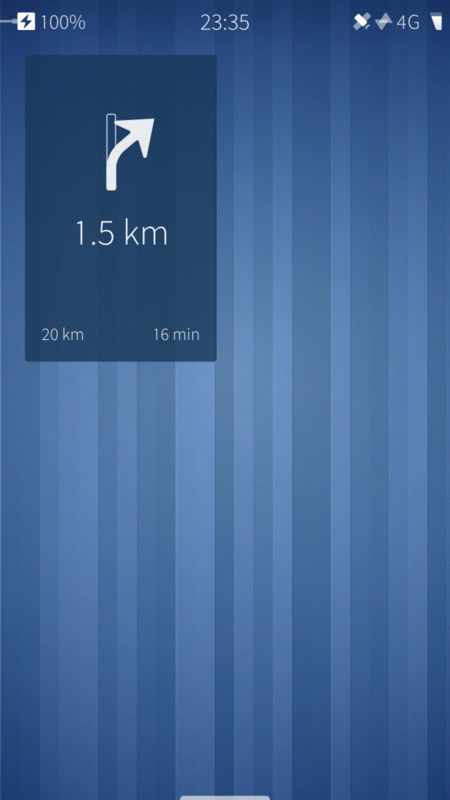 - Would be nice to add more tilt ratios for the navigation map view, i would wish to see furter more ahead of my route. - Incresing the navigation icon/cursor size and color contrast would be apreciated specially while using night mode maps because it become almost invisible from a driving position view point, wnen the phone is on a car holder. - In the same range, specially in landscape mode the top navigation bar could either be reduce in height and still show same infos (can all be move more closer to the top) or reducing it's opacity to allow a maximum of the map viewing would be great. Also increasing the font size and boldness would help readeability a lot at night and or while wearing polarised sunglasses during driving. - Is there any way to have it's volume level more louder ? It is at the same level as the general volume stting but let say that a media playback is running in the background at relatively low level, that render the voice navigation bearely intelligible. They would benefit to play a lot louder or have separete volume controls if that is even possible. -The voice navigation instructions do put in pause the media playback(Jolla mediaplayer) but the playback does not resume aftrewards, adding a command to resume it automatically would be real nice if possible. If it woud risk to initiate a unwanted playback if none was even started during the current navigation it cloud be tie to an aditional option to tick like the ''auto center'' & ''Auto rotate'' that reset to default ''off'' each time WhoGo is open. Sorry for this extensive ''shoping list'' but I am a long time user of the former Nokia Maps/drive navigation trough out all their iterations on Symbian and Meego to the latest Here wego. Not that i am cool with all the end result (in deed many nice features have disapeared over time). I just wish that WhoGo Maps improve as much as possible. - ''auto center'' can be disabled by pressing on current location or, in the meny, by pressing "Auto center on position". Later, you can restore it using the both ways. Although, please do not browse while driving and do it while still or let non-driver take the map browsing over. - max tilt is used already and is hard coded into Mapbox GL. cannot help here, there is issues opened regarding it on mapboxgl projects, you find them and monitor the progress. - I have worked on improving contrast for the night mode. Same goes to rework of navigation mode, including landscape mode and font sizes. The new code will be submitted for review in time. - voice volume and interaction - haven't worked on it. I would suggest that you could look into it and find the way to fix it. you could look into how mimic produces the audio files and see if there are options to increase the volume. as for media playback - check out how to communicate with media players and try to find the way its possible to re-enable it. I found in German directions that the grammar and spelling is wrong. How can I correct this? Is it a matter of WhoGo Maps or OSM Scout Server? Hello, I just tried this app on Jolla1 and it seems to be very nice! I didn't use a native routing app so far. (1) If I start navigation, the app will automatically switch to perspective view. Is it possible to turn off this behavior and is it also possible to toggle between normal map view and perspective view manually? (2) If I start navigation or reroute, the Auto-rotate feature will be automatically activated. Is it possible to turn off this behavior and is it also possible to turn off Auto-rotate permanently? Tilting is configurable via the preferences dialog (pull down menu of the main menu page). It's available only in conjunction with navigation. You can manually turn auto-rotate off after starting navigation by tapping the compass arrow in the bottom right corner of the screen or corresponding toggle button in the main menu. Of the parts that the navigation mode consists of, only tilt is configurable, the rest is how it is. I turned off tilt option but it doesn't have an effect. It still switches to perspective view when starting routing. Any chance to get an option to permanently turn off auto-rotate in a future release? Indeed, it seems to have been broken. Fixed now, will be in the next release. By itself no, maybe later if there's some larger context it fits in. I use this app since a few month, and I'm really satisfied. However, I would like to know if it could be possible to create a route without network connection, because for the moment, I can navigate when my device is offline, but not create a route. Thanks a lot for the job and for your answer. You can do that with a long touch. This generates a blue circle. Clicking this, you can navigate to this point. Oh! That is great. I missed that completely. It may be because I haven't spent much time with the software. Another reason being that it seems like a new UI interaction style which people like me are unaware of. But if we get the option to select both the start and end points on the map, that would solve all the use cases related to navigation. I installed WhoGo Maps and OSM Scout server for offline navigation. Good Apps. Thank you both! But I was surprised to see that WhoGo doesn't allow to select a navigation point on the map. Due to lack of this feature, navigation is almost UNUSABLE for me because Scout server sometimes returns multiple results and sometimes none for my search query (I know, not the server's fault :)). 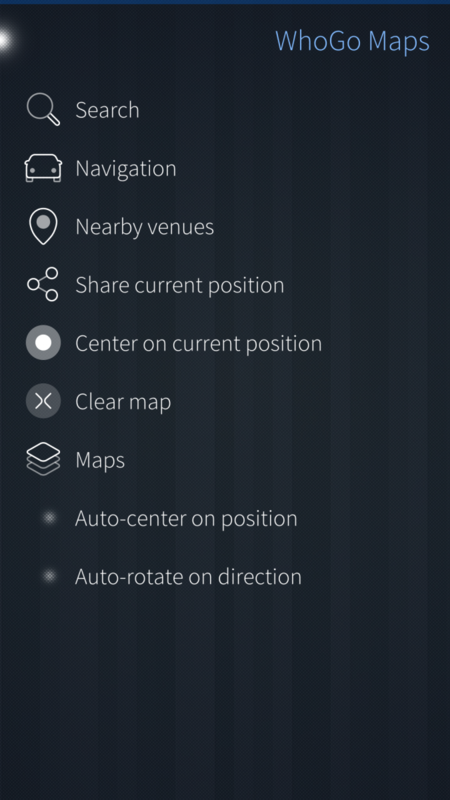 So, if you add an option "Navigate here" in long tap menu or allow to select start and end points on the map from the Navigation menu, it would take the whole navigation feature to new level. That aside, good work guys! Russian translation updated following the 1.0.1 release. Some strings were too long. However, if I use the command line "sailfish-qml harbour-whogo-maps", the app launches & seems to work fine. Removing & re-installing the app did unfortunately not fix the issue either. Same thing! Sailfish OS 2.1.4.14. What recent patch? Which version of Sailfish OS are you using? [D] unknown: 0 - Got library name: "/usr/lib/qt5/qml/io/thp/pyotherside/libpyothersideplugin.so"
You need PyOtherside 1.5.1 or later. Check with "pkcon search name pyotherside" if you have that.